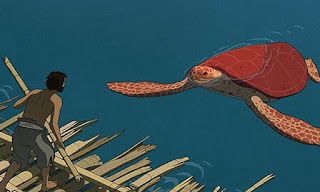 The Red Turtle is a nominee for the Best Animated Feature Film for the 89th Academy Awards, a fantasy film directed by Dutch-British animator Michaël Dudok de Wit in his feature film debut and co-written with Pascale Ferran. The film is a co-production of Wild Bunch and Studio Ghibli in association with Why Not Productions. It tells the story with no dialogue of a man shipped wrecked on a deserted island who encounters a magical red turtle. Don't expect the whimsical wonder of Totoro or Spirited Away. The story is simple, incredibly slow, and beautifully colored. An unnamed man finds himself on an island, where he is able to find food and water. After a time, he manages to build himself a raft, but before he gets beyond the coral reefs he gets bumped by a creature of the sea. The second attempt ends up the same way. The third time, he finds the culprit is a large red turtle. One day he find the turtle on the beach and he gets his revenge by bashing it with a bamboo stick, then flipping the turtle over to bake in the sun. Feeling somewhat guilty, he checks back and finds the turtle had been transformed into a woman, who falls in love with him. They lead an idyllic life with nature, and even have a child. They catch fish, eat fruit, and sleep under the stars. Years pass, and a hurricane flattens most of the vegetation of the island. The son eventually decides to take off and seek other adventures. One begins to wonder if everything is just a figment of the lonely man's imagination. The film is a study of the solitude, the beauty of nature around, immersed in the sounds of silence. Because human noises are limited to grunts and yells, the sounds of the sea, trees and birds are at the forefront. The luxurious bamboo forest, the quiet fresh water pond, the whole expanse of the tiny island is a welcome respite to our own loud and cacophonous world. The art is so Studio Ghibli, but the story is very westernized. It's plodding, and a somewhat male oriented. It's the imagery that will keep you entranced.